This has been a pretty challenging week in Toronto. Our office is about 15 km away from where the attack took place. Not close but close enough to make you ponder. When the news first hit I was in a cab on the way to a meeting with school board and government officials. In the uncertainty and confusion that follows such incidents I noticed some things that I hope speak to who we are as Canadians . . .
Our leaders were measured in their responses until facts were known. No one called for the construction of a wall. Our mainstream media tried hard to share information and not rumours and innuendo. The word terrorism wasn't used immediately - and there was criticism of this from some who clearly wanted it to be a terrorist act. Edit - well, Fox news did call it a terrorist act by Isis for a bit but they don't count. The perpetrator was arrested (by an immigrant to Canada) without a shot being fired (even though he ran at the arresting office pretending to be pointing a gun). Complete strangers stopped and stayed with the injured and deceased so that they would not be alone. We didn't raise our security level and put in place new walls (although they did add some new barriers around our major commuting hub). The community generally came together in a supportive way. here were some unfortunate comments and social media posts by those on the fringes of society which spoke of immigrants, terrorists, and blamed the government for allowing this to happen. Such posts didn't get a lot of traction but the mere fact that they are out the frightens me a bit. For all intents and purposes Toronto continued on . . . wounded, tired, a bit weary, but unbroken. I wish we lived in a world where crap like this did not happen but we do not. In our modern world no one is immune to such hate but how we respond matters. I hope we continue to learn from our experiences, to not overreact, to try to rise above the noise and to be better people. Shelagh J, an old slow travel board member, commented on one of my posts while I was in Rome and suggested that I go and visit this church. She said that it was stunningly beautiful inside. One afternoon, after a snack and some wine at Roscioli followed by some shopping I realized I was quite close to the church. I'd walked past it a few times during the week but today was the day to pop in. Opera lovers know this church well - Giacomo Puccini set the first act of his opera Tosca in Sant'Andrea della Valle (in the Barberini Chapel). In fact, many call this an 'operatic church'. The open majesty of the great white marble hall , glittering with gold and bold paintings, seems to call for some kind of grand orchestral accompaniment. The drama unfolds as soon as one enters the church. Mattia Preti's enormous paintings (1650-51), spreading the story of St. Andrew's martyrdom across the curving apse, have a powerful impact. The three frescoes, St. Andrew Raised on the Cross, St. Andrew's Crucifixion, and St. Andrew's Burial, are both uplifting (particularly as a result of the lofty classical architecture and spacious landscape) and tragic (the saint's fearful expression and mocking crowds). The dome—long the third largest in town, after the Pantheon and St. Peter's—was, like the facade, was designed by Carlo Maderno. 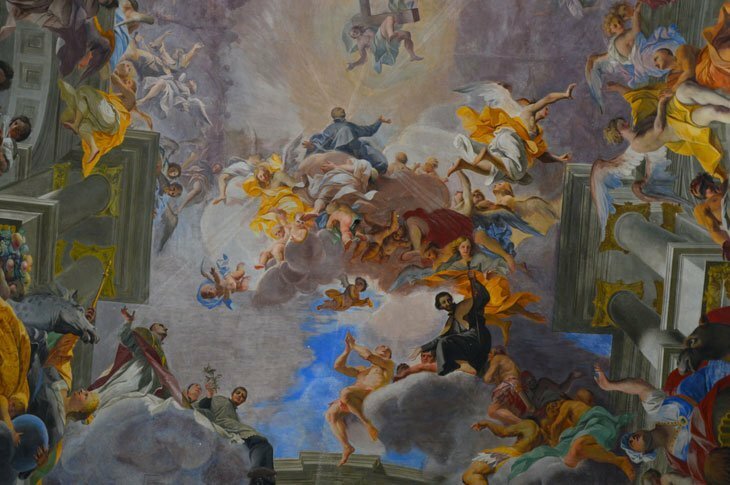 It was frescoed in 1608–27 by two former pupils of Carracci. 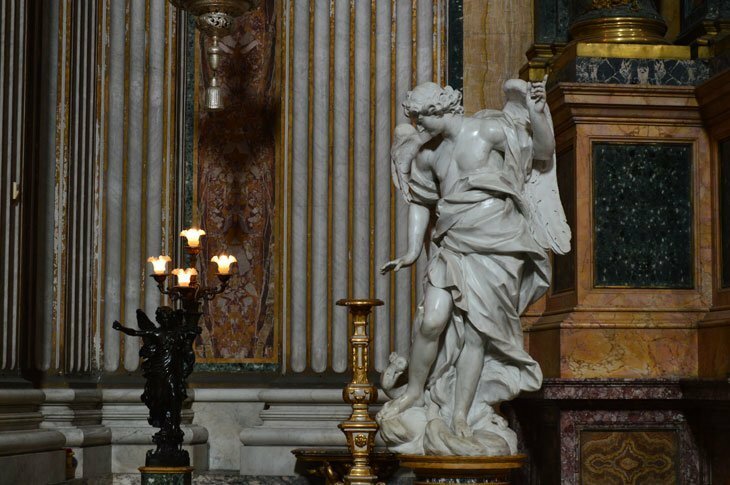 Three powerful pontifical families contributed (and even more unusual for their era, cooperated) to produce Rome's most theatrical basilica - Sant'Andrea della Valle (St. Andrew of the Valley). The famous humanist Piccolomini popes from Siena, Pius II and Pius III, are both buried inside. The audio guide was so good that I felt compelled to make a donation. I'm glad Shelagh J suggested it or I might never have gone in and had this fabulous experience! A friend of ours was in Naples last week. Her pictures and stories has me thinking of when we were there for 5 days in 2011. 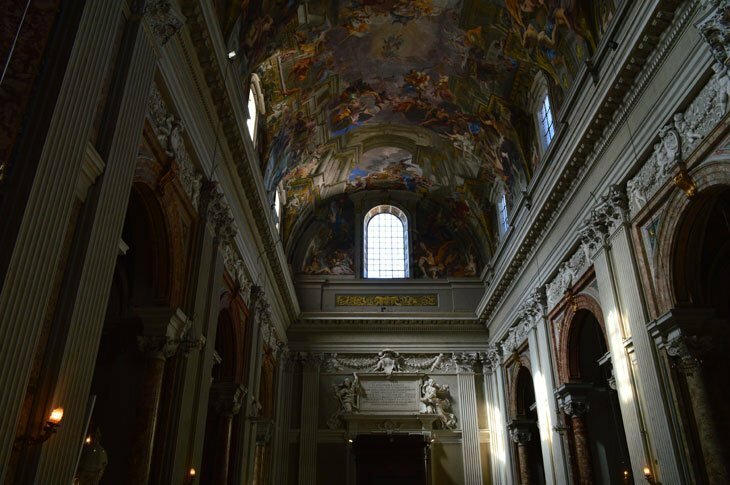 A few years ago when we were in Rome Paul and I came upon this church near the Palazzo Colonna . . . it looked interesting (I know . . . what old church in Rome doesn't look interesting?) but we were unable to enter as there was a service underway. On my recent trip to Rome I wandered past the church as I fled the crush of crowds near the Trevi Fountain. This time it was open but visiting hours had ended. What to do? I noticed other people in the church wandering around. They looked like tourists so of course I went in. I think that the reason why it was still open was because of a group of women arranging the flowers for the upcoming Easter services. Whatever the reason I was happy to wander about. The Basilica of Santissimi Apostoli, the Holy Apostles, is a large church that hosts the bodies of the disciples of Jesus, Philip and James the Less. It was built in the 4th century by Pope Julius I, it was the only Roman church not to be built on the site of a previous ancient building, although building materials came from the Constantine Baths., the original plan was that of the Apostoleion in Constantinople. During the Byzantine era, under Pope Pelagius I and the rule of Narses, it was reconstructed with a greek-cross plan. Adrian I writes to Charlemagne praising this building for its width and its amazing mosaics. In 1348 it was destroyed by an earthquake and only the two sculpted gate lions survive from that building. The two Renaissance cloisters contain a bas-relief of the Nativity by the school of A.di Cambio. The interior, divided into three wide naves by big pilasters and matching Corinthian pilaster strips, with three chapels per side, each one roofed by a dome, ends up being splendid for the decorations and frescoes. This was the tomb of Clemente XIV by Canova. There were stairs heading downwards on either side of the altar. They weren't blocked and since I was already wandering the church when it was supposed to be closed I headed down. There I found a crypt which isn't as old as it appears. Designed to look like an ancient a catacomb even though catacombs were never allowed within the city walls. During this construction in 1879 the remains of the apostles Philip and James were found in an ancient crypt underneath the church. They had rested there fro 1200 years. Another interesting feature of this church is a monument to Michelangelo. When he died in Rome his body rested in the church for a short period of time prior to being returned to Florence. Travel Tuesdays - Anwhere but here right now! As I type this post the wind is howling outside and ice pellets and freezing rain rattle against the window. I am sick of cold. I am sick of winter. For travel Tuesdays I am going somewhere warm and relaxing . . .
Ahh . . . summer in Tuscany. Of course, municipal contracts for snow and salting ended on April 1. 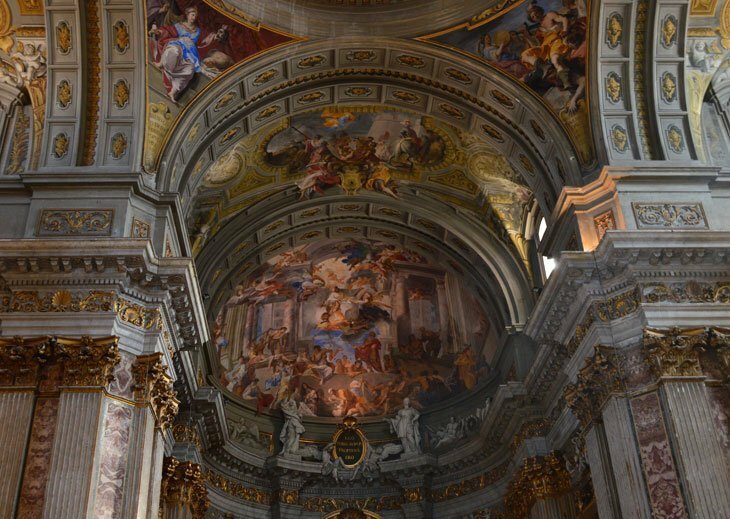 The Church of Saint Ignatius of Loyola (Sant’Ignazio Church) is a Jesuit Church that was built between 1626 and 1650 with a rich and fascinating history. It was right around the corner from my apartment and I walked by a number of times before heading in. Nothing can quite prepare you for the immense sights inside and the painting from way on high to below. 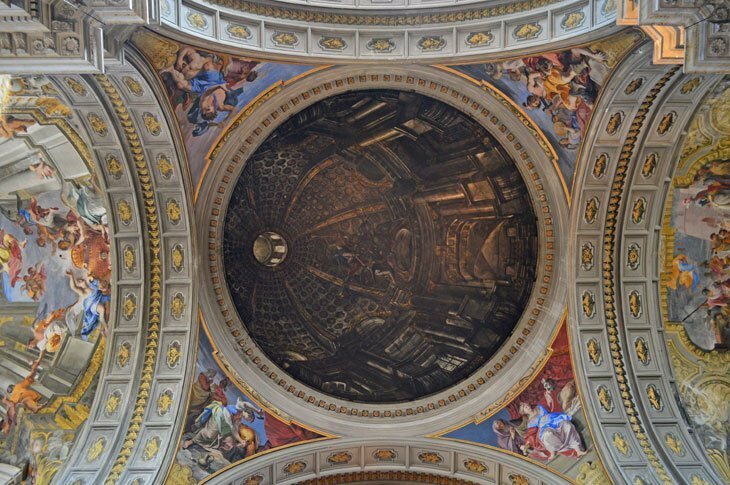 Andrea Pozzo of the Jesuit order painted the roof aspects in particular with a trompe l’oeil or optical illusion. 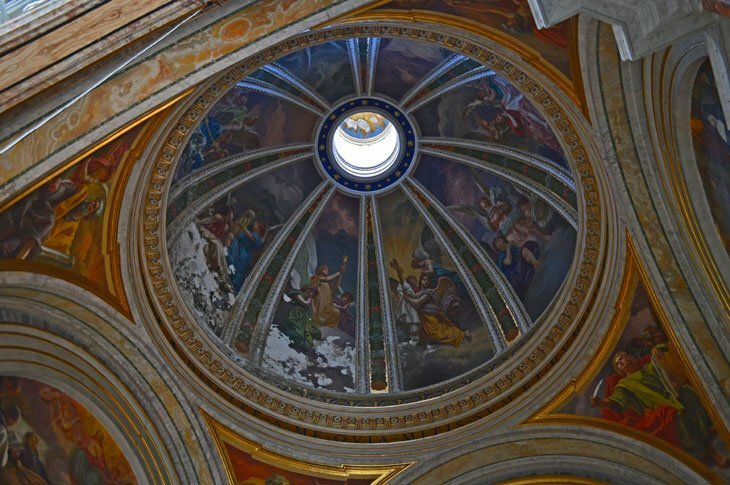 The great dome (or so you think) that you see above you is actually a flat painting with 3D effect. If you are inside the building and you look at it from almost all angles. The first time I wandered in it was cloudy outside so the effect of sun streaming in through the windows was a tad misplaced. On another more sunny day it was quite effective. Every inch of this building inside has such fine beauty and detail. You walk around and around to take closer looks at everything. However then you turn round and see the rest of the place in so many different angles that mesmerized is not a strong enough word to describe the feeling I had. To the left and to the right of the main area there are side chapels that seem to transform you to a whole new great church of their own accord. A top tip is to not just stay in the centre of the building which is where many stop, stay and stare. Wander behind all the pillars and you will find many many treasures for the eyes. I visited a number of markets while I was recently in Rome. . .
Ah, fresh and seasonal produce.